Brand and his workers were building the first interurban trolley line to the tiny foothill town of Glendale. The gash they blasted out—known as the Allessandro Cut or Edendale Cut—kept the Glendale Line’s maximum grade at three percent. And when service debuted in April 1904, the cut became a scenic highlight, as the red cars whisked their passengers through an Arcadian landscape of planted pine tree forests and rolling hills. Real-estate development eventually displaced the pine trees, and the trolley line closed in 1955. Later a new generation of workers reshaped part of the abandoned right-of-way into the Glendale Freeway. But a stretch remained untouched. Lying fallow now for nearly 60 years, this old cut through the hills, produced from dynamite, is now celebrated for its unexpected quietude. 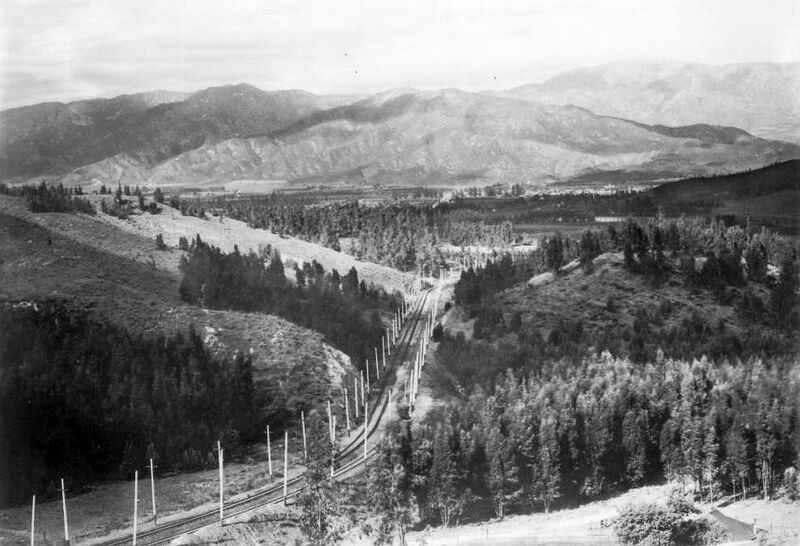 Above: Circa 1905 view of the Corralitas Red Car Property, looking north toward Glendale. Courtesy of the USC Libraries – California Historical Society Collection.